I have been asked on many occasions over the years to what design code the Chilton was built, I tell people what I was told, in that the Chilton was designed to conform to the then (1936) full C of A requirements, however this is sadly of no particular help to those builders who wish quite naturally to acquaint themselves and possibly their own airworthiness authorities with the design code used to ensure the aircraft's structural integrity. 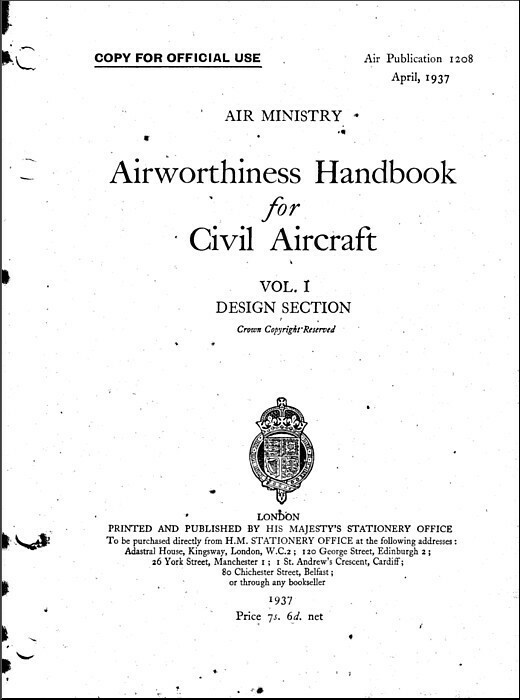 "The design code used for de Havilland civil aircraft of the Chilton's era was AP1208, 'Airworthiness Handbook for Civil Aircraft', but usually with AP970 ('Handbook of Strength Calculations') mentioned as the source of methodology for derivation of load factors. Knowing Ward & Dalrymple's de Havilland Technical School background one can also be near certain that their guiding reference would have been Practical Aircraft Stress Analysis, authored by their lecturer at de Havilland, D. R. Adams. Air Publication 1208 categorises 'Civil Flying Machines' basically as Normal Category, Aerobatic Category and Special Category. There's the rub because although the requirements for Normal and Aerobatic are quite clear, unfortunately AP1208 states that "for aircraft in the Special category definite requirements are not specified as each individual aircraft will be treated on its merits". Although I have yet to positively establish the actual certification category of the Chilton, I think I can safely assume that the Chilton was built to the requirements of the Aerobatic Category, but was, by the necessity of using a non approved engine, certificated in the Special Category but I hope to eventually be able to substantiate this assumption. I have a 1937 edition of AP1208 and Practical Aircraft Stress Analysis and hope to obtain a contemporary edition of AP970 sometime. AP970 - Handbook of Strength Calculations. Practical Aircraft Stress Analysis, by D. R. Adams (published by Pitman's 1936). The four Chiltons were too small for impressment so spent the war years in storage in the Earl of Cardigan’s hanger at High Trees aerodrome. It was the partners intention to recommence production of the Chilton after the war but the redesign of the Olympia sailplane and the prototypes construction along with the Company’s diversification into electrical consumer goods meant that the Chilton’s re-emergence was fairly low priority. The tragic death of Andrew Dalrymple on Christmas day 1945 no doubt dealt a shattering blow to the Company’s plans. One of the employees did indicate to me that quite understandably, this accident was instrumental in Reggie Ward’s decision to withdraw from the aviation side of things and that he felt the future of Chilton Aircraft lay with the electrical consumer products market. There is a letter reproduced on this page dated 25th April 1946 written by the late Forester Lindsley whilst he was employed by Chilton redrawing both the Chilton Olympia glider and the Chilton Monoplane. This letter shows that even just after the war when there were large numbers of war surplus aircraft going cheap the Chilton still held a fascination for many. 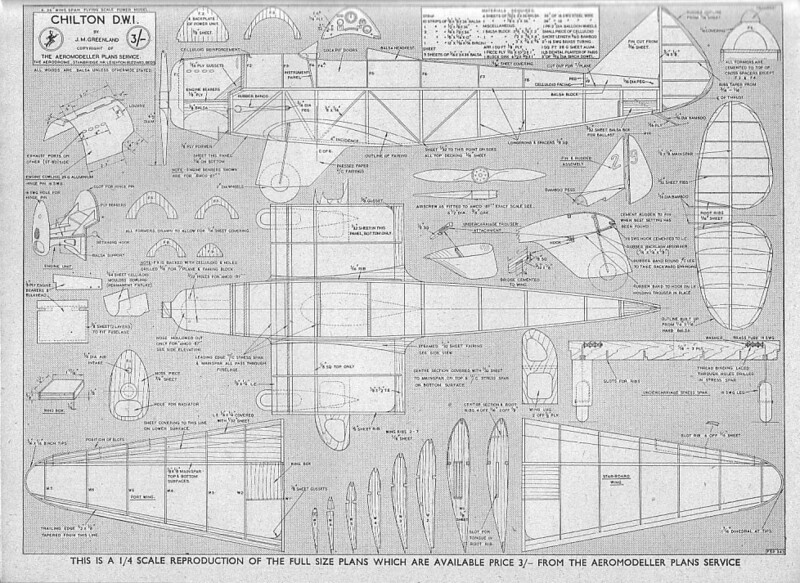 When I first saw the original Chilton Monoplane drawings, I noted some had been updated with dates just post war and bore the initials “FL”, when talking to Fred Luscomb (the original employee) in the seventies, I mentioned these drawings and his initials, but Fred said the “FL” were not his initials but those of Forester Lindsley who subsequently emigrated to Australia and in later years became involved with that Country's home built aircraft movement. 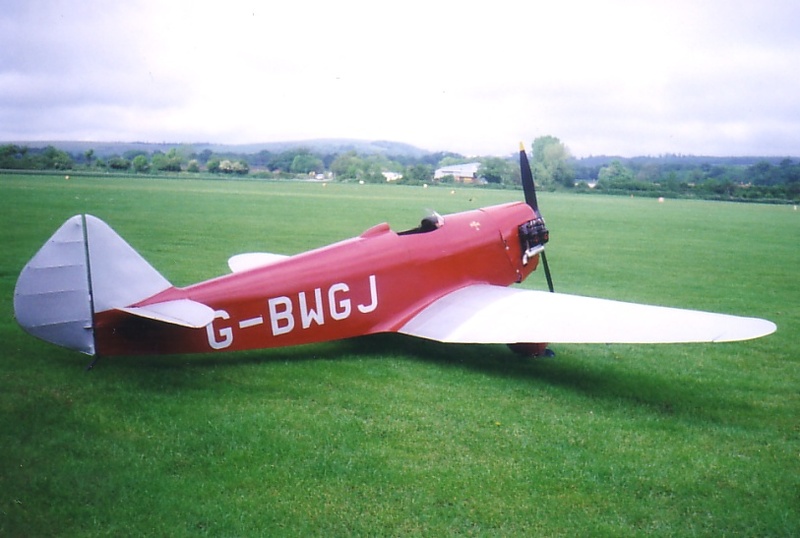 In 1952 Group Captain E. L. Mole, who had obtained G-AFSV on loan from Mr. Ward for racing, was instrumental with others in setting up the Ultra Light Aircraft Association, (later to be re-named the Popular Flying Association). 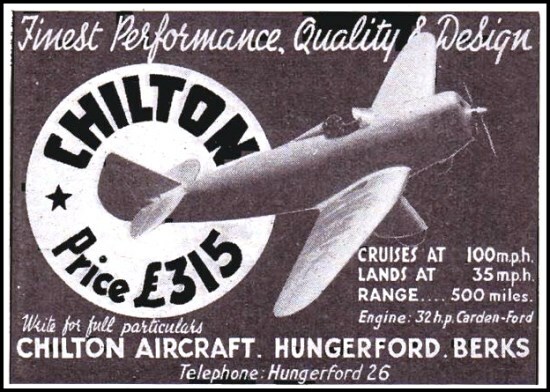 The Chilton was looked at as a very promising aircraft for the post-war enthusiasts to build and Reggie Ward was approached, but because of his involvement with what had by then become the highly successful manufacturing company of Chilton Electric Products along with Chilton Engineering that manufactured the tooling and carried out sub contract work, he understandably declined to entertain any further aircraft production for which no obvious market existed. 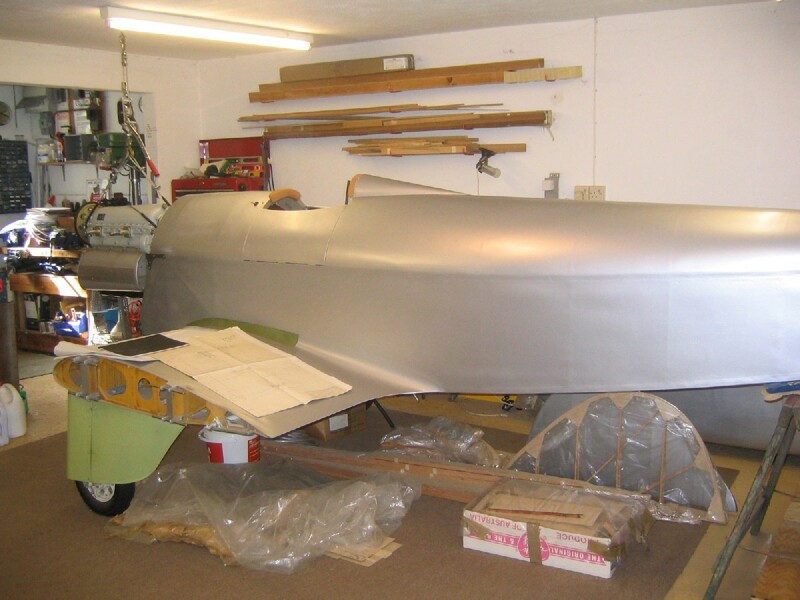 However, concurrent with this it was proposed that the students of The College of Aeronautical Engineering at Redhill, as a design exercise, design and build an updated version of the Chilton to be powered by 50hp German Zundapp engine that had come into the Country as war booty. 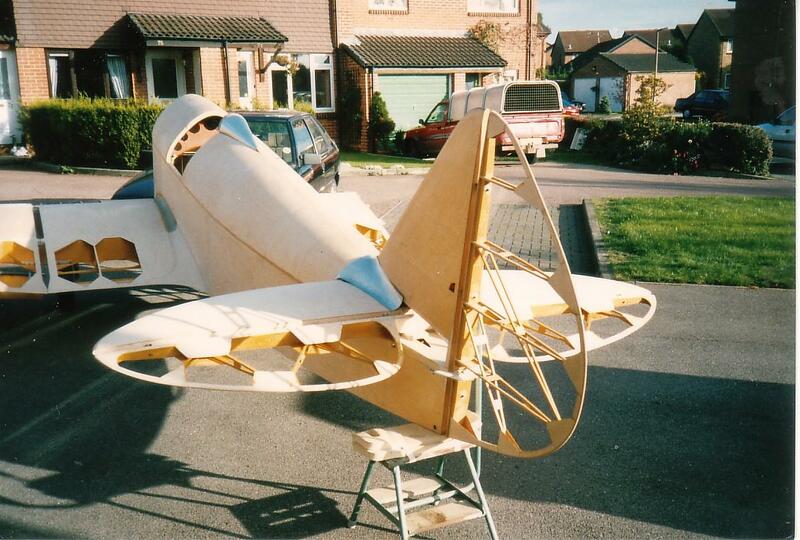 The redesign was duly carried out and a modified version with high aspect ratio wings was to be built by the students but for reasons not known it was not proceeded with. Unfortunately the Chilton drawings that were borrowed were not all returned, inquiries made on my behalf at the College some twenty five years ago regarding the drawings were unsuccessful, as they had no knowledge of the drawing's existence. As the Chilton was and is such an attractive and efficient aeroplane, Mr. Ward continued to receive requests over the years and during the early sixties decided to at least complete the drawings that had been untouched since 1946 when the redrawing was started but not completed. There is a letter reproduced on this page dated June 1963 enquiring of George Cull of the Aeromodeller if he was aware of any Chilton drawings as he was at this time obviously trying to regularise the drawings situation. 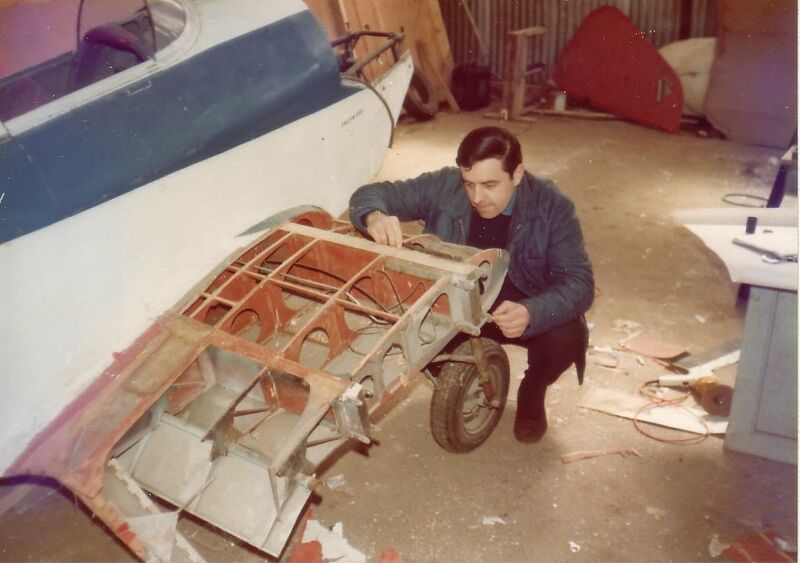 During 1965 Mr Ward was approached by the late Chris DeVere with a view to building a Chilton. All the original drawings drawn in 1936/37 still in Mr. Ward’s possession, had by this time become faded to such an extent that it was impossible to produce a legible print. Mr. Ward therefore engaged an aviation consultancy firm to re-draw them, however after this had been done, it was found that there were too many drawings missing from the set to make construction viable, so no further action was taken. When the Chiltons were produced originally there were many full size templates in lieu of drawings and of course over the war years these had disappeared. 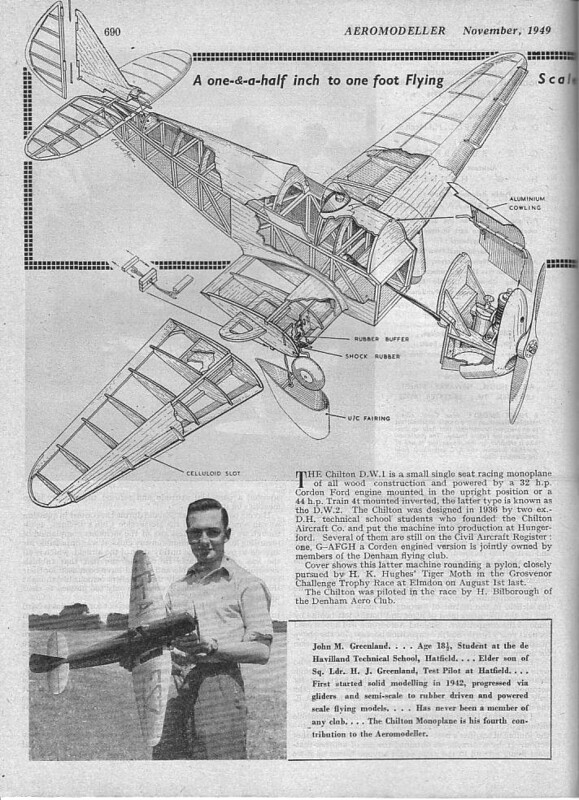 However my own enthusiasm for the Chilton Monoplane sprang from an article on ultra-light aircraft published in the 1955 edition of the Aeromodeller Annual. 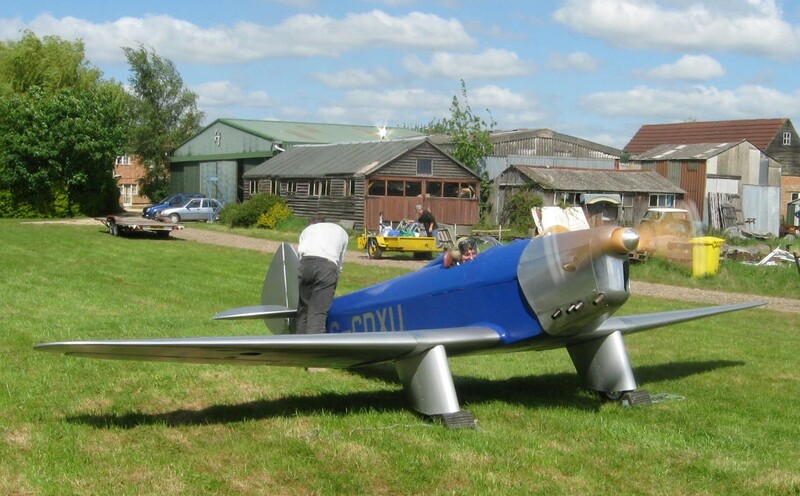 It was this article with photos of Chiltons G-AFSV & ‘ESZ, that as a 10 year old I first became enamoured with the Chilton, although it was to take me a further twenty four years to actually acquire one. 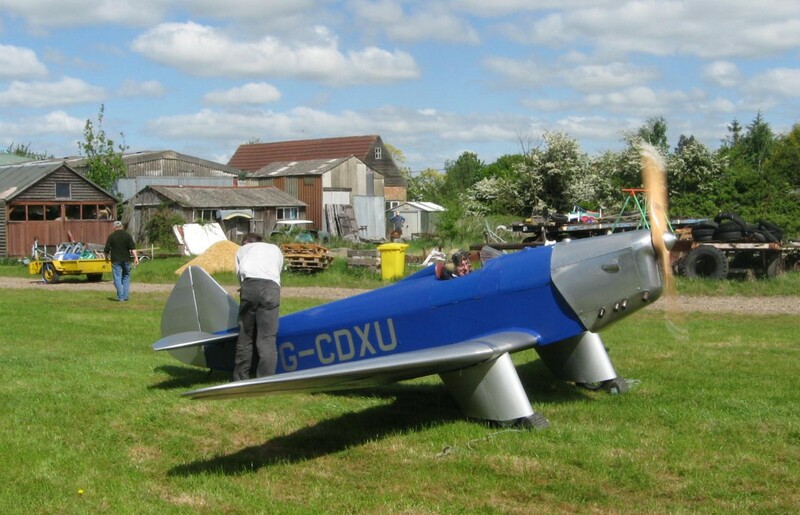 Interestingly in that same article were photographs of an Aeronca 100 and the Dart Kitten both of which I subsequently owned, also mentioned was the BAC Drone motor glider, I currently have a half share in one of the three surviving examples – so my reading that article has proven to be rather expensive over the years! 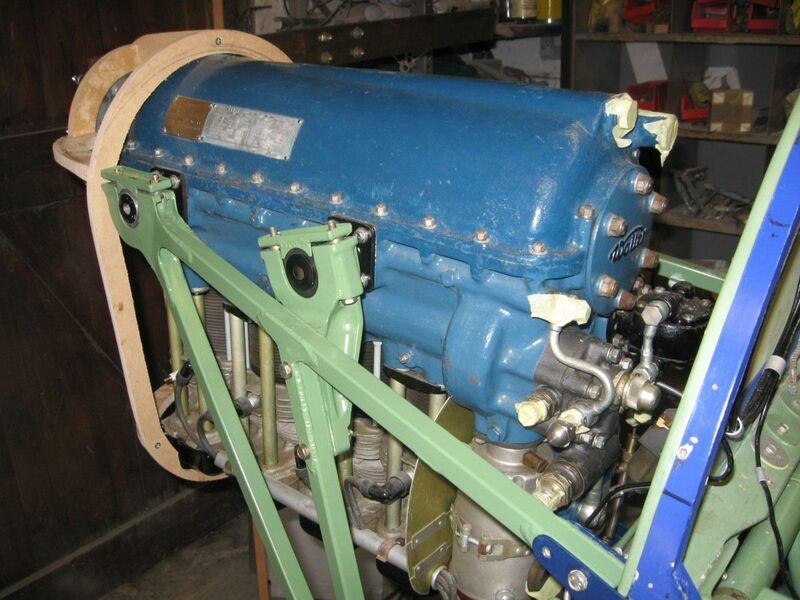 I first tried to purchase a Chilton when G-AFSV came up for sale in March 1967 but I was unlucky at that time, however I subsequently approached the various Chilton owners with a view to acquiring one of the surviving machines but without success. During 1974 I contacted Mr. Ward to ask about the possibility of building a Chilton, Mr. Ward advised me of the problem of the missing drawings, but kindly offered to let me have prints from those drawings that existed. On checking through the drawings I found that many of the fuselage and centre section drawings were missing, although the centre section spars and airfoil sections were there, as well as the forward fuselage and basic fuselage elevation. This was encouraging, as these were the key drawings around which the missing detail could be added. There were no assembly drawings apart from the general arrangement drawings for the major component parts. 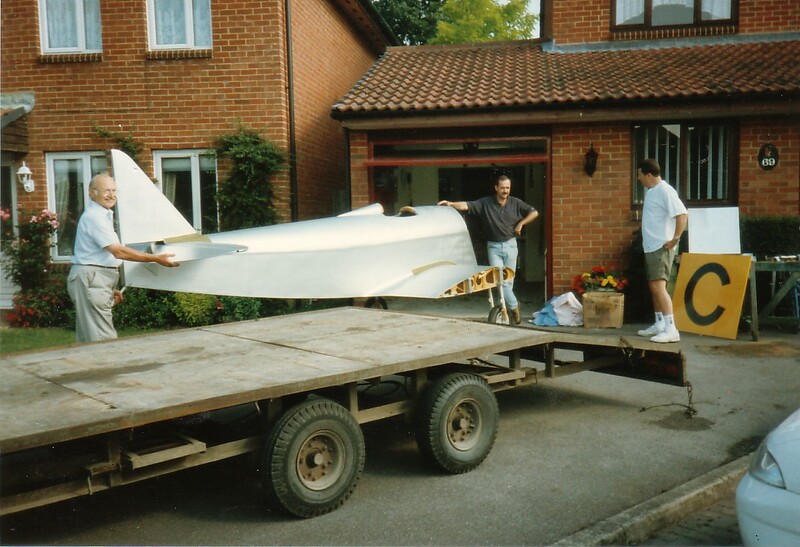 At that time Wing Commander John McDonald had just commenced the rebuild of G-AFGI. John kindly consented to my request to closely examine the internals of his machine to gauge the extent of the missing drawings. 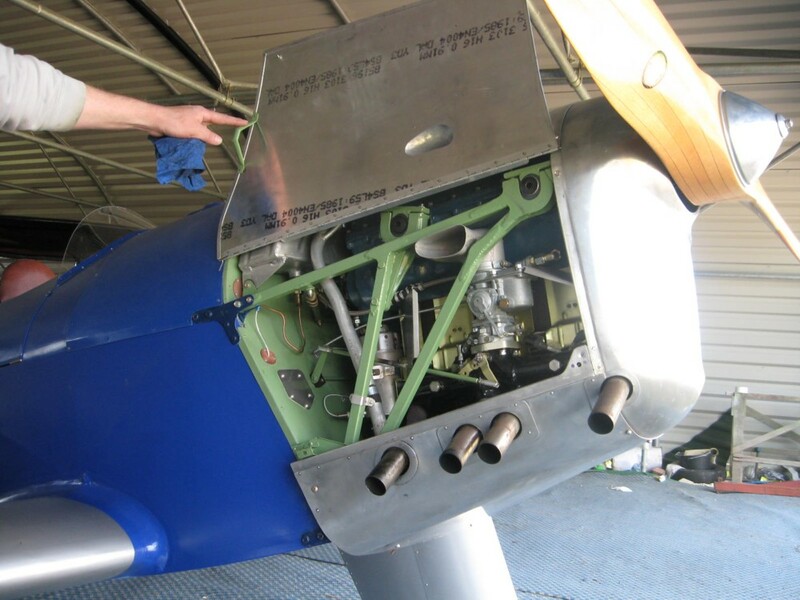 After carrying out a comprehensive survey and photographing the aircraft in detail, it was obvious that a lot of work was required to complete the drawings to an acceptable standard of detail. 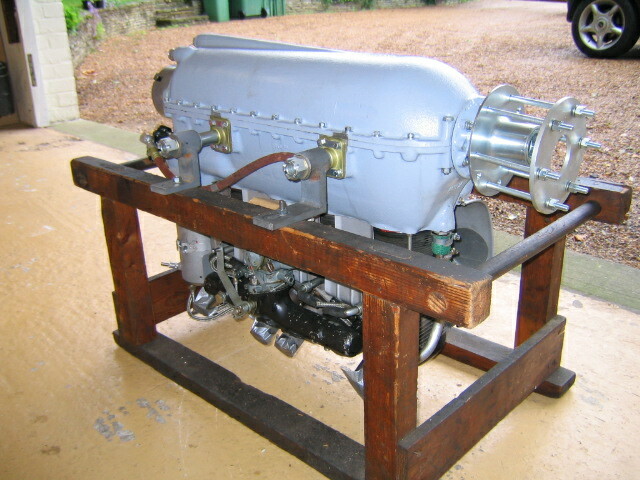 Note in the photo on the left that the Carden-Ford mount is still in place with a tubular sub-mount bolted on to mount the Lycoming. However in June 1978 I finally realised my ambition to own a Chilton, when I exchanged my Comper Swift G-ABUS for the then Mikron II powered G-AFSV. 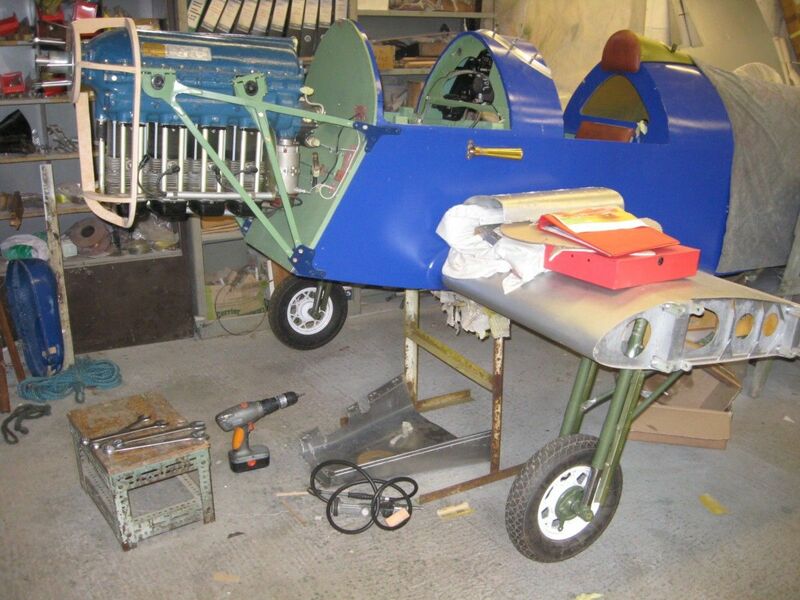 As it was my intention to restore 'FSV to her original configuration I commenced what transpired to be a very lengthy restoration, though the search for Train engines in France, moving house and the acquisition of several other vintage aircraft over the years has not helped. As I carried out 'FSV's restoration I took the opportunity to make drawings of the components and assemblies that I knew to be missing from the set. This further delayed my progress but I felt it a worthwhile exercise should I or any other Chilton owner need this information in the future. At this stage I intended the drawings purely for my own reference, so I did not stand on ceremony too much regarding finer points of draughting. 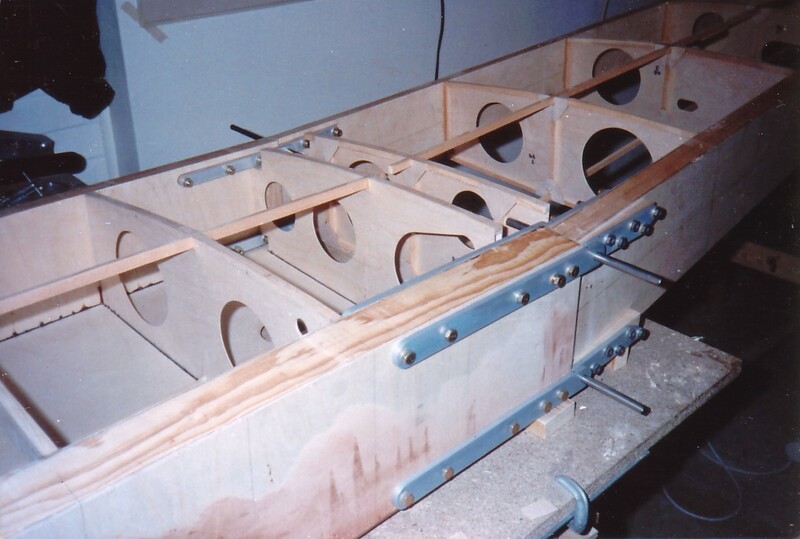 During 1980 I was contacted by Don Giffin from Canada, who subsequently obtained permission to build a Chilton from Mr. Ward. With the typical drive and enthusiasm of our North American friends he commenced construction, using the incomplete set of drawings with myself supplying him with the missing details hastily drawn on a piecemeal basis. 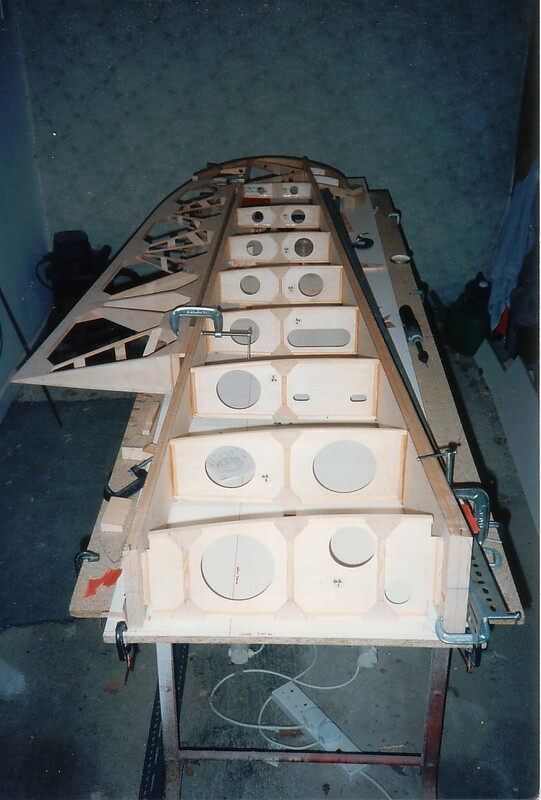 In 1984 I decided to restore the mortal remains of the prototype G-AESZ that I had acquired some years before, because of the extensive nature of 'ESZ's rebuild it was obvious that a comprehensive set of drawings would assist its rebuild, especially as it was my intention to contract out most of the work due to my commitment to ‘FSV. Mr. Ward kindly gave me the remaining components from the fifth uncompleted Chilton, all the original pre-war drawings and various folders containing the stress calculations to assist with the re-drawing. As my re-drawing progressed, there came a point where my drawings exceeded the number of original drawings, as the originals were not numbered, it seemed logical to integrate both sets of drawings into one unified set. With Mrs. Ward’s approval this has been done, with new drawing numbers allotted. As my drawings have been completed over a twenty year period, some of the earlier ones are not of the standard I would like, so in due course I shall re-draw these. However, these drawings can be made available subject to certain conditions being fulfilled on an individual basis, details of which are available upon application. Naturally to the best of my knowledge the drawings are accurate, but as I cannot guarantee their accuracy, the drawings are supplied on the basis that it is the builder’s responsibility to validate the structural integrity of components and assemblies built from them, so any drawings will be issued purely on that understanding. 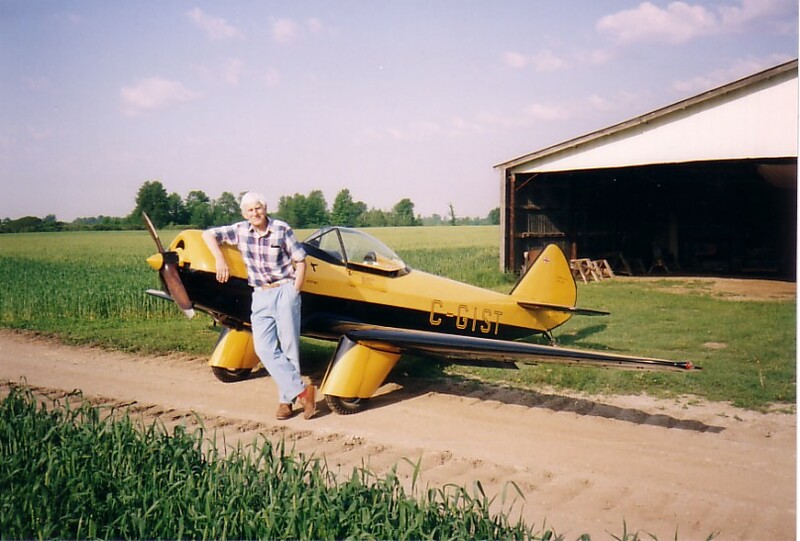 The first new Chilton built to the drawings flew in July 1997 built by Tim Harrison and is powered by the 55 hp Lycoming engine removed from 'FGH. 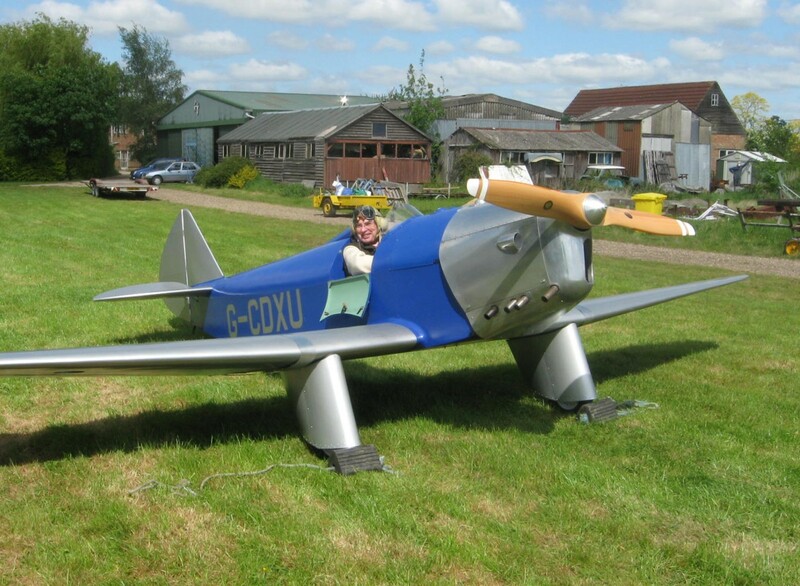 The aircraft is currently in store as Tim is working abroad in Africa. See the builders list for current status of other projects. The further purpose of this page is to show the various modifications that have been embodied to improve upon the original design. As the two partners got it right first time, the nature of the mods are only minor or those required by safety legislation such as the repositioning of the rear straps of the seat harness. Double click on the thumbnail for a larger image. 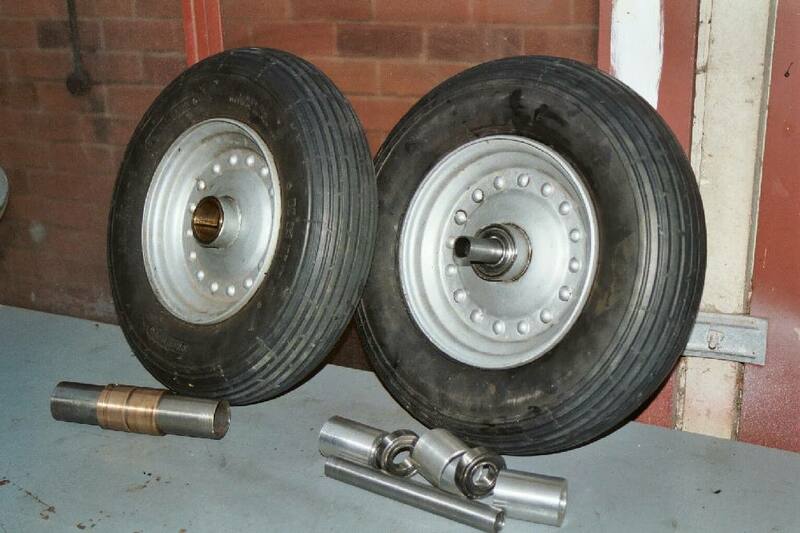 One area that can be improved upon is that of the wheels, those fitted on my aircraft are the original pressed steel wheelbarrow wheels fitted with 4 x 8 tyres, they’re quite heavy but I wish to retain them in the interests of originality. However the wheel bearings are plain phosphor bronze bushes running on a 1 5/8” dia T45 tube axle, thus the surface contact area of the bearing is considerable and even with constant greasing they are very inefficient in terms of rolling resistance. In the early fifties Grp. Cpt. 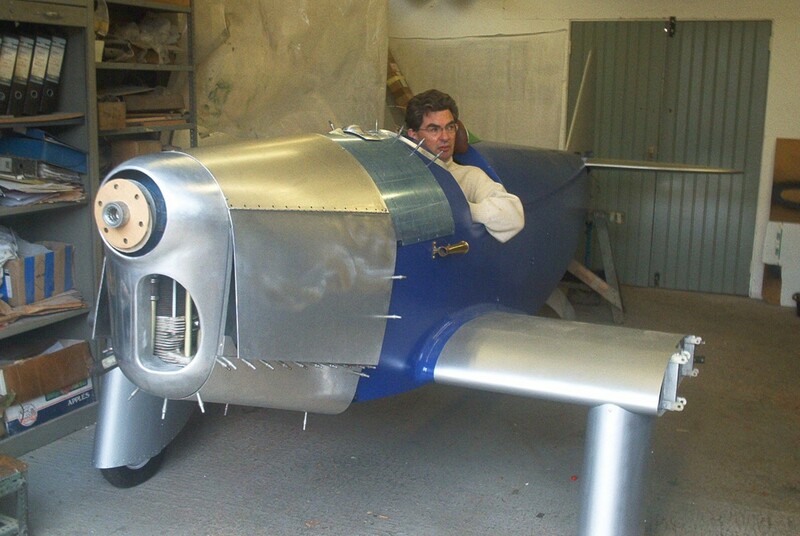 Edward Mole arranged for Chilton G-AFSV to be overhauled by The Collage of Aeronautical Engineering as a project for the students. At that time the students proposed a simple mod to change the plain wheel bearings to ball races. Unfortunately this mod was not carried out most probably due to time constraints, but a drawing was prepared with the bearing modification and alternative schemes for the attachment of the wheel axle to the undercarriage leg. I’ve no wish to modify the attachment of the axle as this is unnecessary, however the bearing mod is simple and effective and does not require any modification to the wheels or undercarriage leg. The original wheel bushes are phosphor bronze 1 7/8” od x 1 5/8” id, there are two bushes per wheel, the proposed modification was to replace each of these bearings with a ball race. The radial depth of the ball race would necessitate a reduction in axle diameter to 7/8”. Dural bushes would be fitted into the axel attachment tube at the bottom of each of the four telescopic undercarriage legs to accommodate the reduced diameter of the axle. To try and quantify the potential improvement offered by this modification, ball races were fitted to one of ‘FSV’s wheels - see photo. An unscientific but nevertheless effective test was carried out with the aircraft jacked up, by the simple expedient of spinning the wheels. Firstly one running on the original plain bearings, secondly a wheel running on ball races, the latter showed a very noticeable reduction in drag that manifested itself by the increased length of time the wheel continued to rotate. Both my Chiltons have now been modified to this standard. This has also resulted in easier maintenance, as the bearings are sealed they are effectively maintenance free and the wheels no longer require constant greasing. The weight of an original axle complete with 2 bronze bushes & 2 bronze spacer/thrust washers is 1lb. 3ozs. The weight of the new axle (material 4130, 7/8”x 0.065” wall) with 2 ball races, 1 internal bearing spacer bush and 2 dural axle converter bushes is 1 lb. 8ozs. Type of ball races used are FAG EEB.2Z.C3 - 1.875” dia. x 0.875” bore x 0.5” wide. 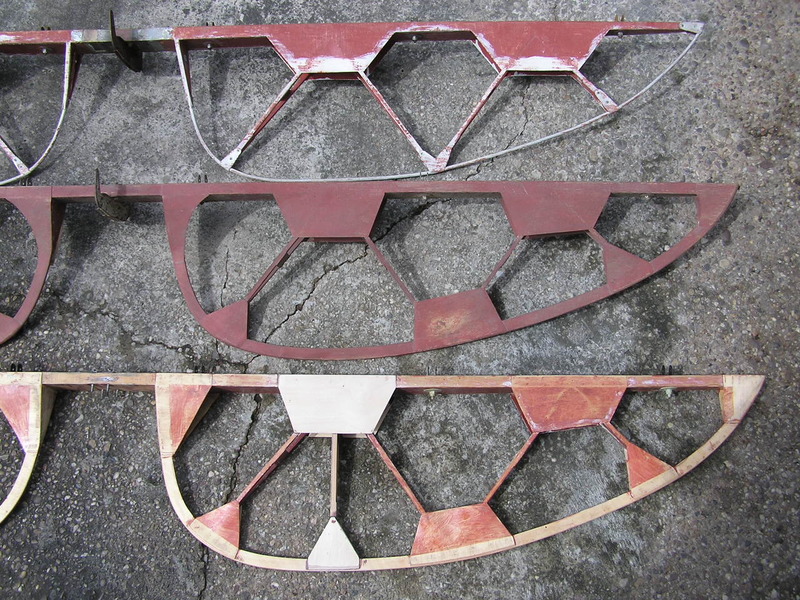 Shown in the thumbnail to the right is the undercarriage leg assembly from ‘FGI that has been modified to take a Lambretta wheel with an integral axle. 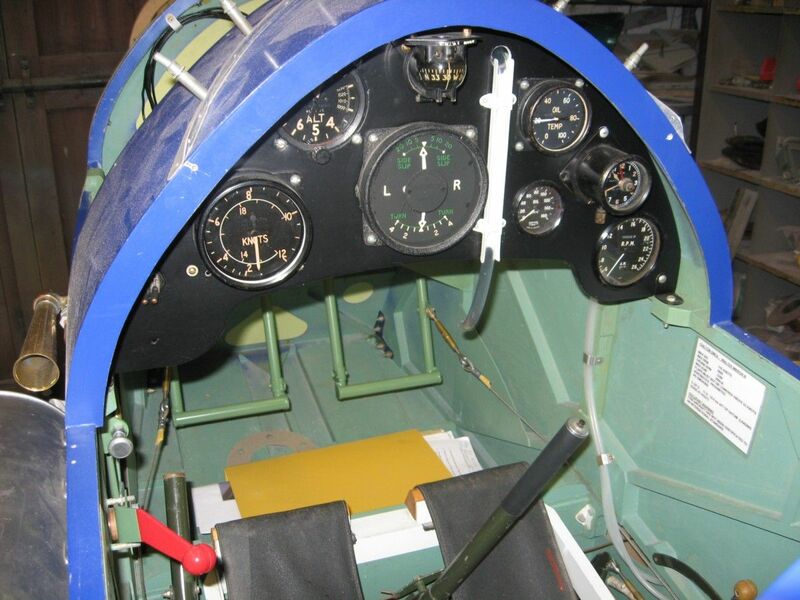 The original seat harness anchorage points were located on each side of the seat on the front and rear faces of the rear spar. Thus the rear straps came straight up one’s back over the shoulder’s and connected with the two lap straps just in front of one’s stomach. 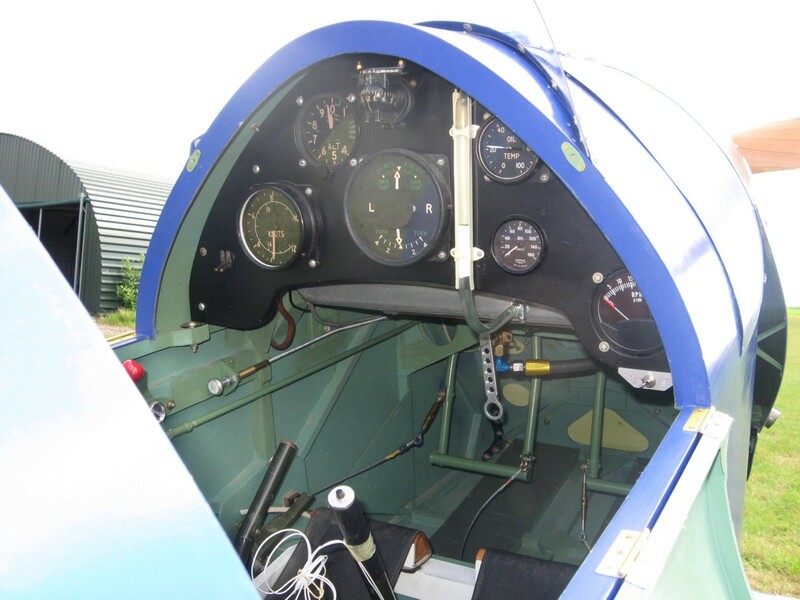 This arrangement prevented the pilot from falling out but did not restrain the pilot’s upper torso from moving in an arc forward towards the instrument panel. 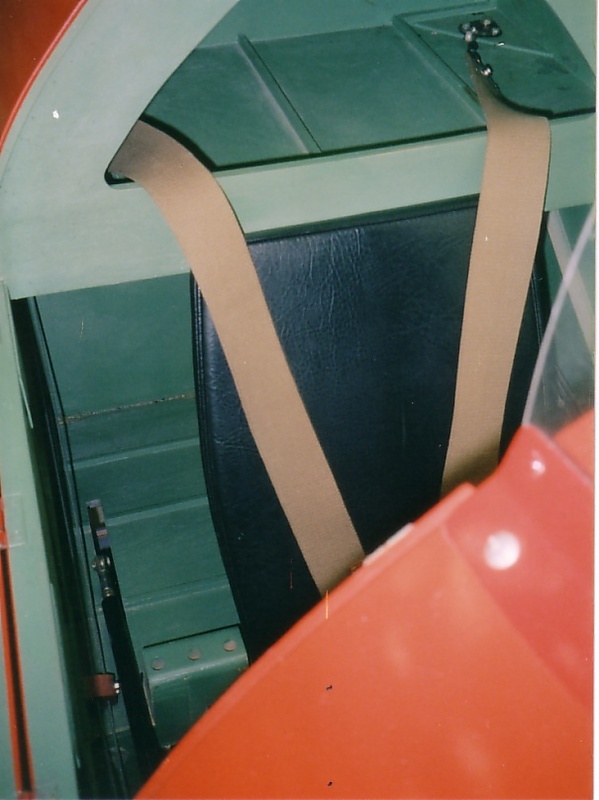 Recent thinking has outlawed this arrangement and the attachment points for the rear straps have to be anchored higher in the fuselage to restrain the pilot’s upper torso from moving forward in the event of a crash. 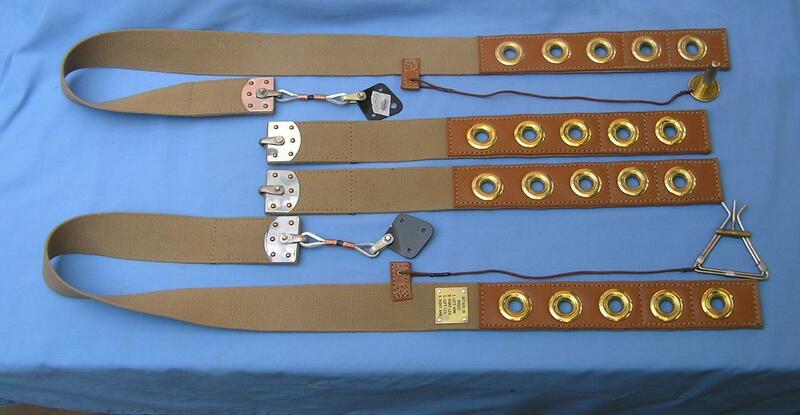 Stuart Hoy of Anglia Sailplanes now makes original pattern Sutton harnesses primarily for the Tiger Moth market, however Stuart will supply whatever harness length is required to suit as he has done for me, see his website :- Anglia Sailplanes Website. 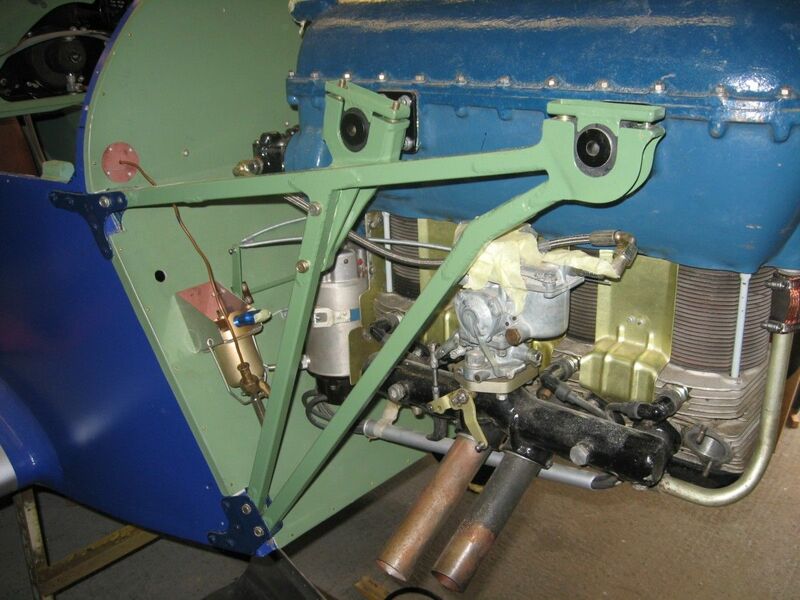 The aileron push rod was connected to the aileron actuating arm by an inverted ball joint of the type more commonly associated with engine controls. 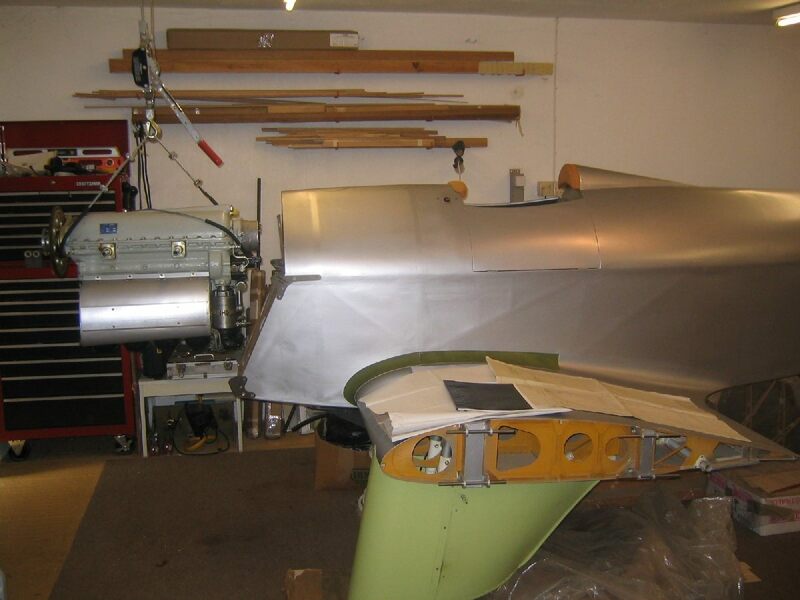 Any slight play at this joint translates into excessive play at the trailing edge of the aileron so this item has to be kept greased and adjusted to overcome this. A better solution was the fitting of a rod end bearing that would give the angular movement required by the push rod but without the need for constant adjustment & greasing and it is also slimmer in section. 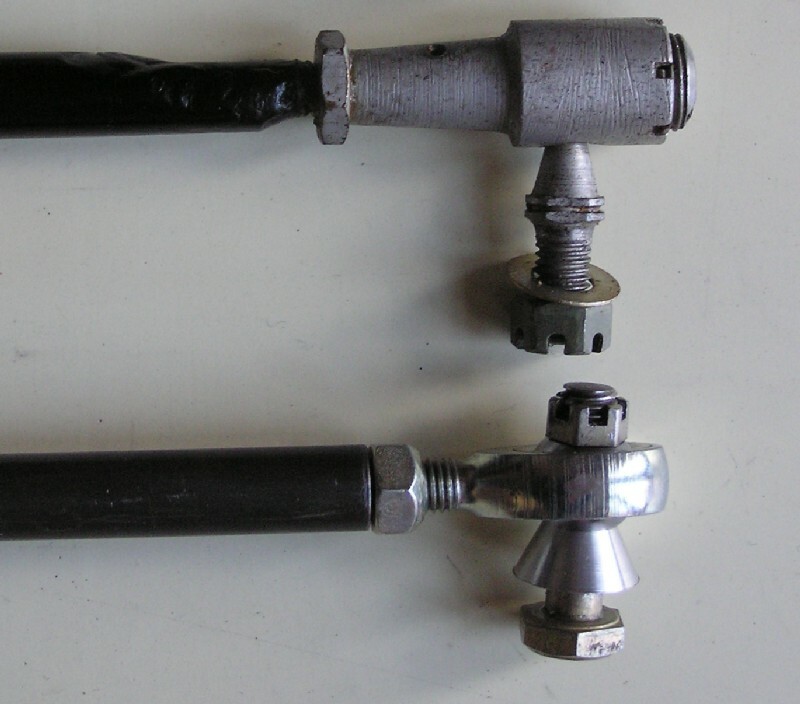 When adjusting the length of the push rod, the ball joint has to be turned through a full 360 degrees, whereas finer adjustment is possible with the rod end bearing as it only requires to be turned through 180 degrees or half the pitch of the thread to be refitted. The rod end assembly used is made by AURORA and is a type MM-4 with a ¼” – 28 male thread that screws directly into the aileron push rod, see link to page with full specification:- MM-4 rod end spec. I recently noticed distortion in a portion of the trailing edge of the elevator centered on the longest part of the unsupported trailing edge. This is caused by the seemingly continuous shrinking action of the cellulose dope on the elevator fabric as my elevators have been covered for over 20 years. 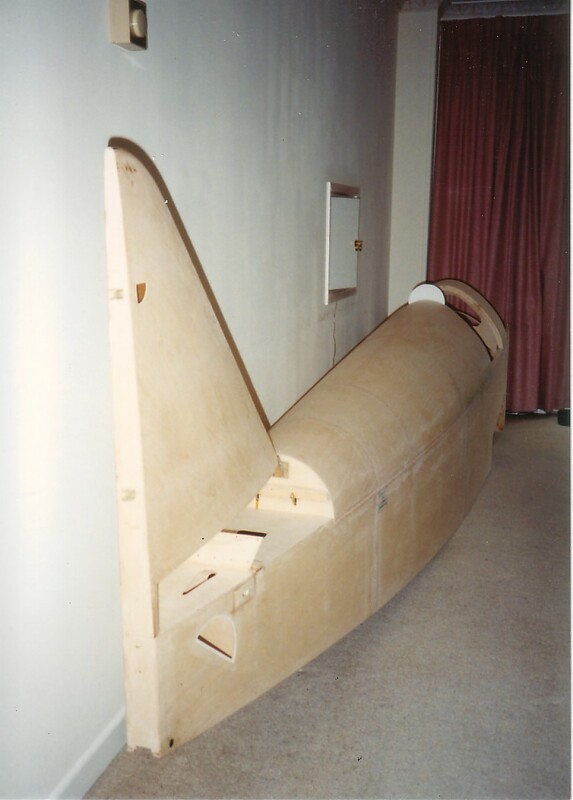 The trailing edge had distorted both sides in exactly the same manner, it had pulled the outer edge of the trailing edge upward by about ¼" midway between the two widest diagonal ribs. I devised a simple fix to insert a slave rib to help support the trailing edge in this area. 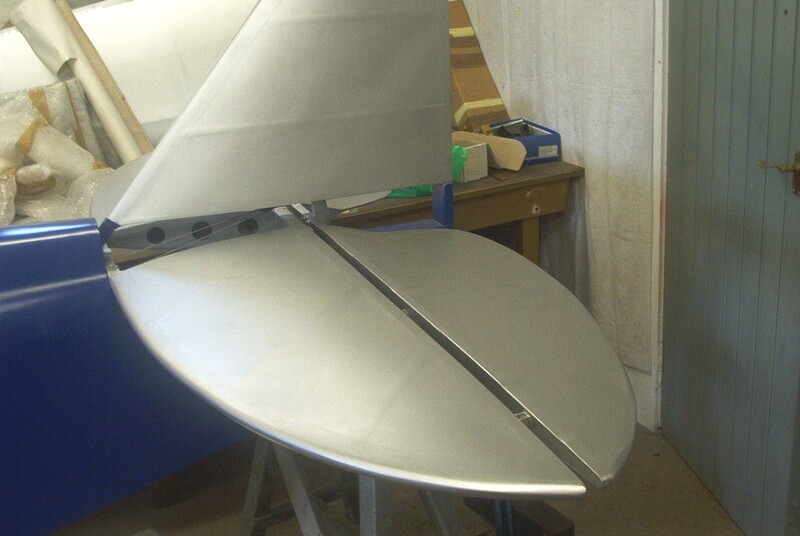 However whilst looking at G-AFGI recently I particularly noted that its trailing edge did not exhibit my problem and it was only when I actually touched the fabric in the offending area that I felt a rib underneath the fabric, unseen, in precisely the position I intended to fit mine. See photo to illustrate position of the new rib as per 'FGI. 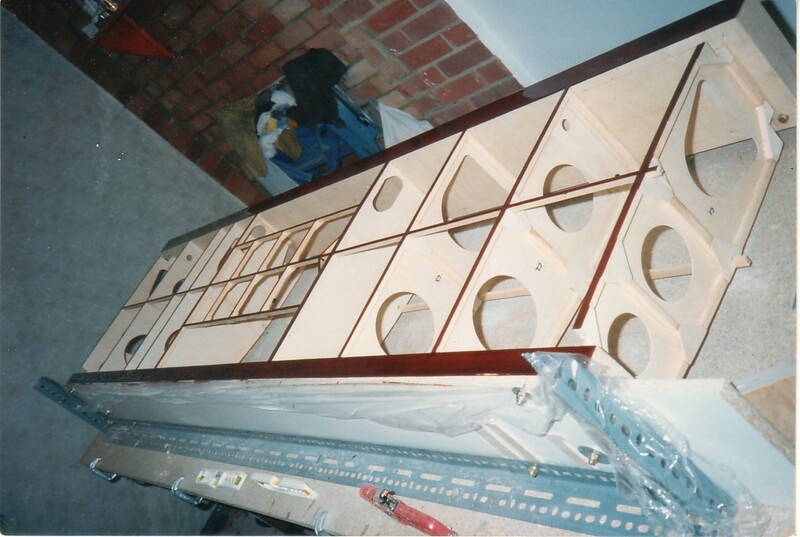 The top elevator in the photo is the original from 'ESZ with alum tube trailing edge, very light weight but the graceful curves of the elevator were soon lost when the shrinking action of the dope transformed the curves of the tube into a series of straight line between each rib. 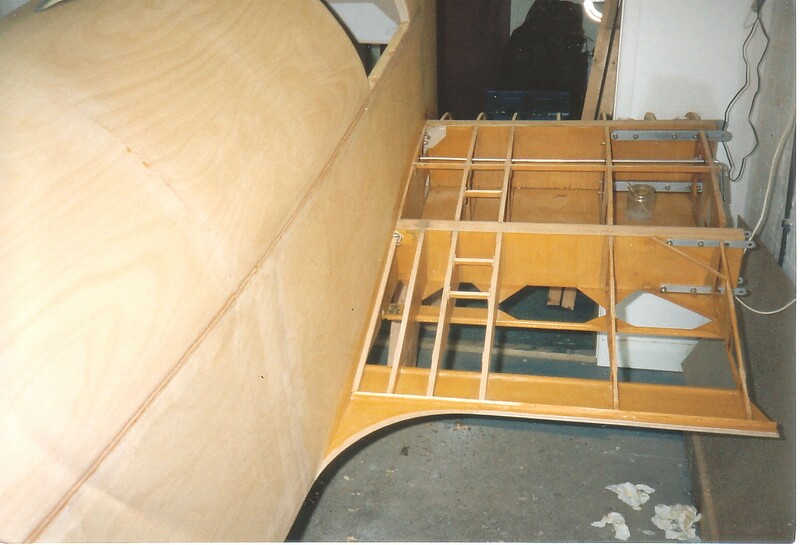 I have pulled the tube back out to its original profile for the photo, but this type of trailing edge was not used again and all subsequent machines had a ply trailing edges to maintain the curve. The middle elevator is from the fifth unfinished Chilton, so is completely untouched from 1939. 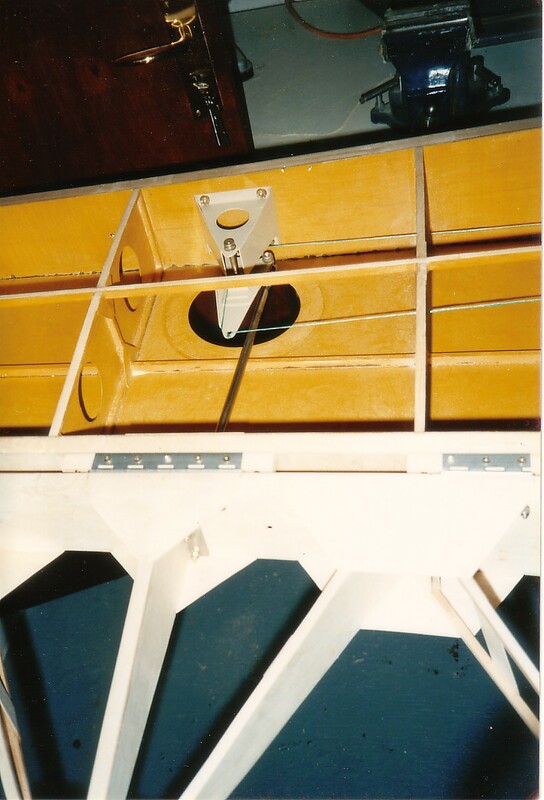 Bottom elevator is from 'FSV and shows the additional rib that I have inserted as per 'FGI, and I am sure will not allow any distortion in future. Carden Ford mount top view. Carden Ford engine cowling sketch. Suggested Mikron III engine layout. 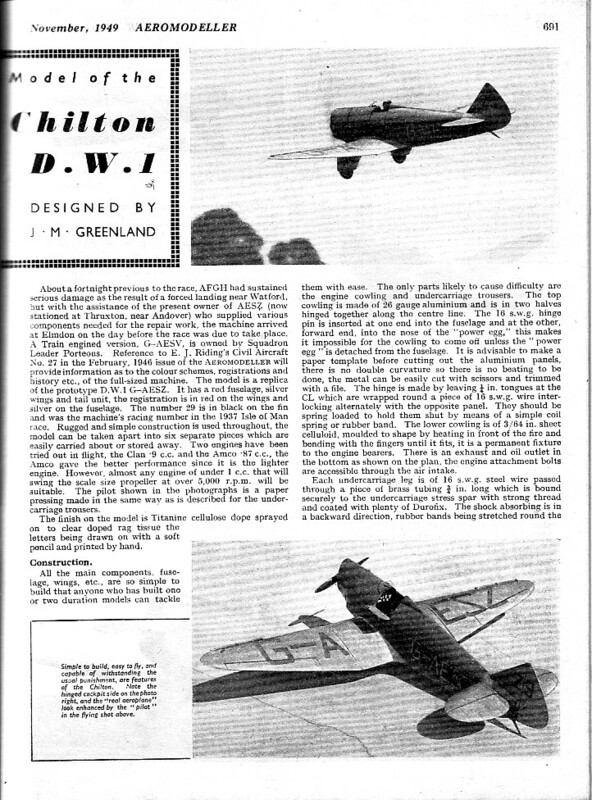 Pre-war Chilton sales brochure (700kb). Sales letter from Chilton Aircraft dated 1946. Items from the pages of Flight magazine. Letter from Reggie Ward dated June 1963. Chilton cut-away drawing This link is to a cutaway drawing by Jim Newman, how I came by it I can't remember but is very nicely done. 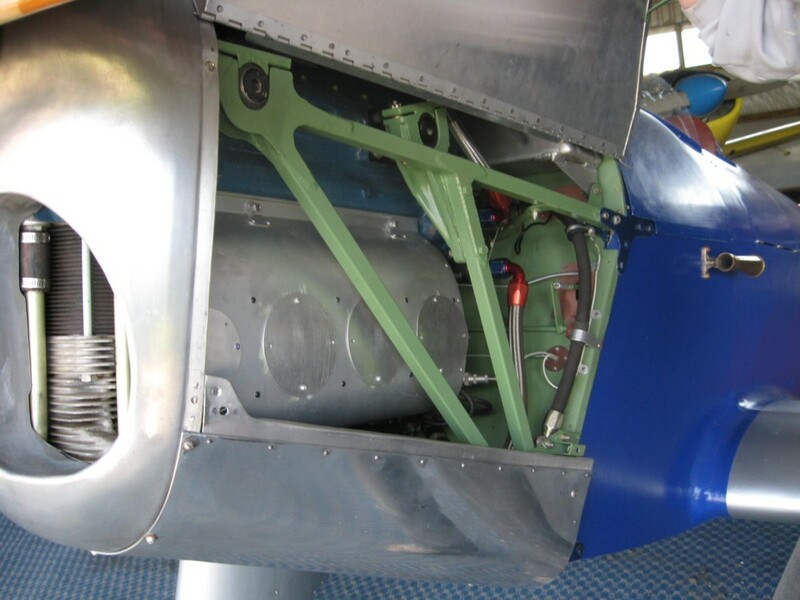 A French made wheel to be fitted to G-AFGH but without the brake unit fitted. Brown Brothers catalogue of standard AGS parts. A guide to the materials used in the Chilton's construction. Link to US Mil Handbook of material specs. 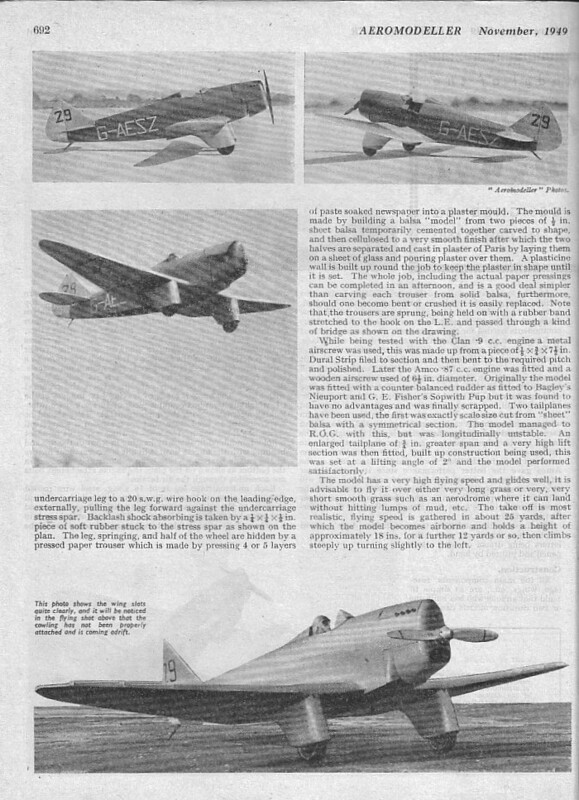 An Aeromodeller Chilton article from November 1949 by John Greenland.